The most important historical epoch of Aachen started with the takeover of the government by Charlemagne in AD 768. The imperial palace by the hot springs soon became his permanent residence and so developed into a spiritual and cultural center. Two hundred years later he was canonized, which resulted in a flow of pilgrims wishing to see Charlemagne’s tomb and the relics he gathered during his life. The town’s ties with Charlemagne are reflected in numerous architectural heirlooms and memorials in the townscape. When he began work on his Palatine Chapel in 786, Charlemagne’s dream was to create a ‘new Rome’. 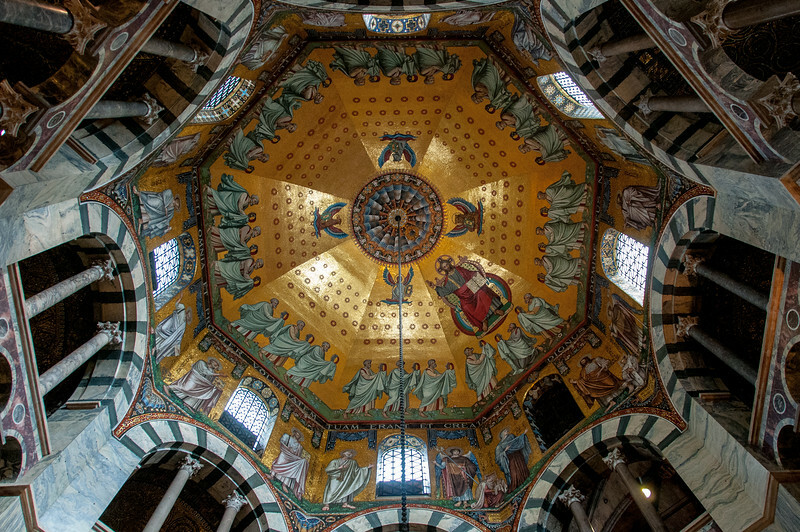 The core of Aachen Cathedral at the time of its construction was the largest dome north of the Alps. Its fascinating architecture, with classical, Byzantine and Germanic-Franconian elements, is the essence of a monumental building of the greatest importance. 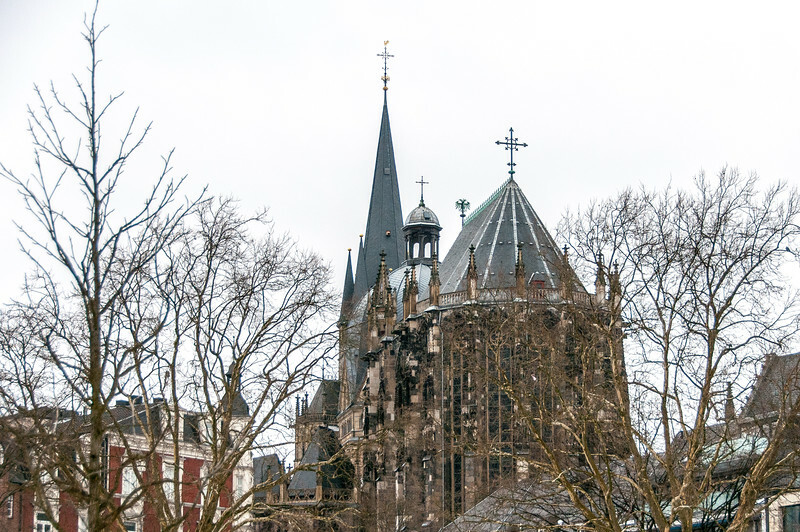 For 600 years, from 936 to 1531, Aachen Cathedral was the coronation church for thirty German kings, and even today it retains much of the glamour of its historic past. Aachen is not the grandest or most beautiful cathedral in Europe. In fact, it is quite small compared to most cathedrals, especially its neighboring world heritage site, the Cologne Cathedral. Only half of the building was created in the gothic style, so it lacks the large spaces which can be found in other cathedrals. However, if I were to create a list of the must-see European cathedrals, Aachen would be high on the list. It is one of the oldest cathedrals in Europe, with its octagon dome having been erected in the 8th century. It has the highest gothic windows of any cathedral in Europe, with its windows in the choir rising over 20m. It is also one of the most significant buildings in Europe in terms of history. It was founded by Charlemagne and was the coronation site of the German kings for over 600 years. 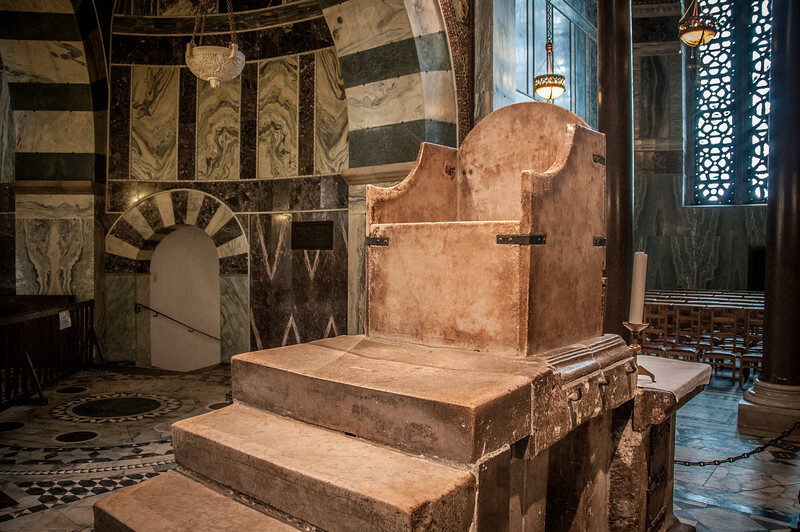 Its association with Charlemagne made it one of the most significant Christian churches in the western world outside of Rome for several hundred years. Aachen also has the distinction of being the first world heritage site in Germany and one of the original 12 world heritage sites created in 1978. Aachen Cathedral is a cultural UNESCO World Heritage Site located in Aachen, Germany. It is a Roman Catholic Church that features Gothic and Ottonian architectural style. The groundbreaking for this church was in the year 796. 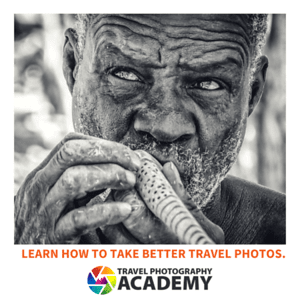 It was added to the UNESCO World Heritage Sites list during the 2nd session in 1978. The Aachen Cathedral was consecrated in 805. It is also the seat to the Diocese of Aachen. The cathedral is known as one of Europe’s oldest cathedrals. Aachen Cathedral was constructed upon the order of Emperor Charlemagne. By the time of his death in 814, he was also buried in this church. 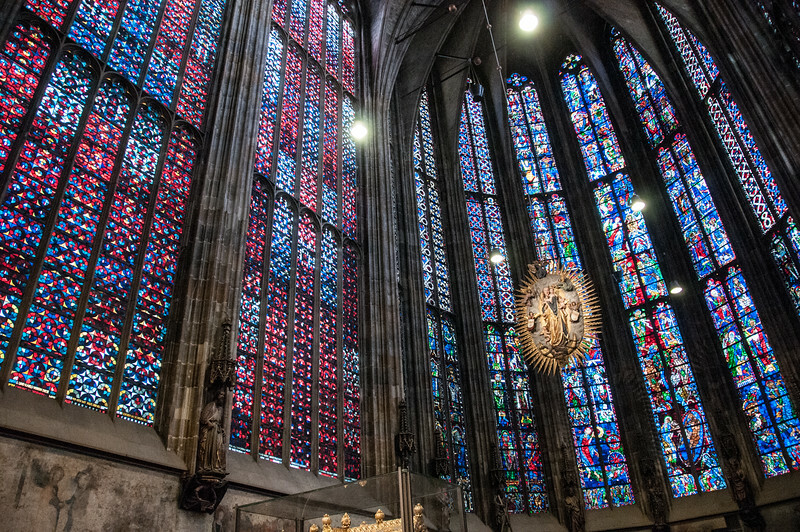 It is also the mother church for the Diocese of Aachen and the site of coronation for 31 German kings and 12 queens over a period of nearly 600 years. Hence, the cultural and religious significance of Aachen Cathedral cannot be denied and is deeply etched into the history of the city. 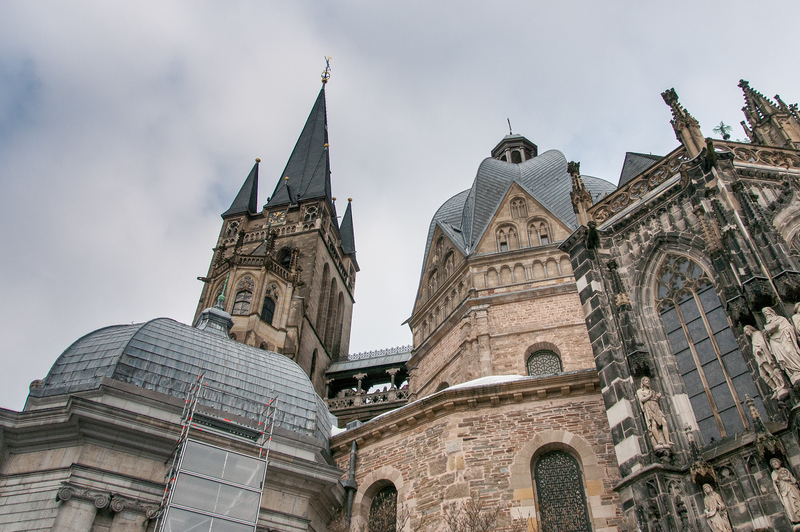 The Aachen Cathedral features two distinct architectural styles. In fact, there are some elements of a third architectural style too. The main feature of the cathedral is the Palatine Chapel. It features Romanesque and Carolingian architectural styles. The chapel was modeled after the San Vitale in Ravenna, Italy. Another key component in the church is the choir. This one features a Gothic architectural style. Meanwhile, there are some parts of the church that are distinctly Ottonian in terms of its architecture. In addition to the features mentioned above, there are also several side chapels that form Aachen Cathedral. The first chapel is the Matthiaskapelle or the Chapel of St. Matthew. This chapel was built in the late 14th century and is located right next to the choir. The second chapel is the Chapel of St. Anne or the Annakapelle. It was originally intended to be a narthex to the cathedral gates before it was closed off and turned into a chapel. Another chapel in Aachen Cathedral is the Chapel of Hungary. It is located on the south of the cathedral’s western façade. It was originally a gothic side chapel. However, it was remodeled in the 18th century in a Baroque style. Another chapel located on the western façade (this time on the northern side) is the Chapel of St. Nicholas & St. Michael. This chapel was built in the 15th century. It features a neo-baroque altarpiece that was created by Joseph Buchkremer in the 20th century. This cathedral also served as the burial place for the canons. On the northeastern part of the cathedral, there is the Chapel of St. Charles & Hubert. Other chapels that also belong within the cathedral complex are the All Saints and All Souls Chapel and the Baptismal Chapel.